The most difficult part of driving into Panama, was finding the Costa Rica customs to get stamped out before entering the country. It took quite a while getting all the vehicle paperwork sorted out but from what we expected, it was a walk in the park..funny how situations that should be difficult can turn out to be easy and more so, the vice versa. The first big town we drove into was David (apparently from King David) and we were surprised at how developed it was. We stopped at a mall and found ourselves in very fancy, up market grocery store where everything still seemed as expensive it was in Costa Rica…so much for hoping things would be a little cheaper. 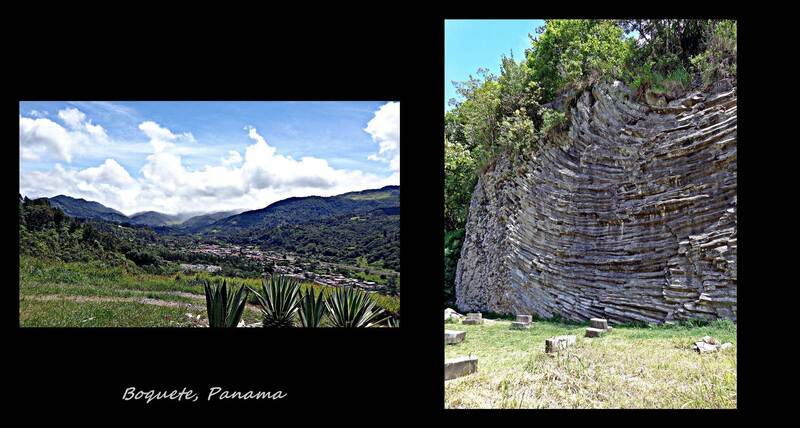 Our next stop in Panama was in the highlands, at a small town called Boquete. Coming from hot and humid David, Boquete seemed like a different country. We wanted to drive up to the camping spot in Parque National Volcan Baru, but for once the road really did require a 4×4 vehicle and turned so rocky that we decided it wasn’t worth breaking the Cruiser. When we stopped for some petrol in the town we met two new friends, Halina and Kris which wanted to hear all about our travels and so invited us to their home. We had such a great time hearing about their journey from their homecountry Poland to Canada after WW2 and eventually to this picturesque town in Panama after retirement. They were so kind to offer us an apartment below their home and we ended up visiting for two nights having a typical Polish dinner the first and a (somewhat) typical South African dinner the second (how can you call it Bobotie without Mrs. Balls!). Thanks again guys, you were our favorite part of the whole Panama! After Boquete we had a long stretch to the town of El Valle. We wanted to visit the islands of Bocas del Torro but it was a lot of kilometers just to get to some sketchy towns where would have to leave the Cruiser and take a ferry to the islands. The whole ordeal didn’t really seem worth the trouble and after seeing so many beach towns, another one seemed redundant. El Valle is pretty similar to Boquete, without the great views, but with never-ending downpours. We camped/swamped at Cabanas Potosi owned by Panama’s most famous bird guide, Mario Bernal which was a great host for the few days we stayed there. As this was the closest campspot we could find to Panama City (100km! 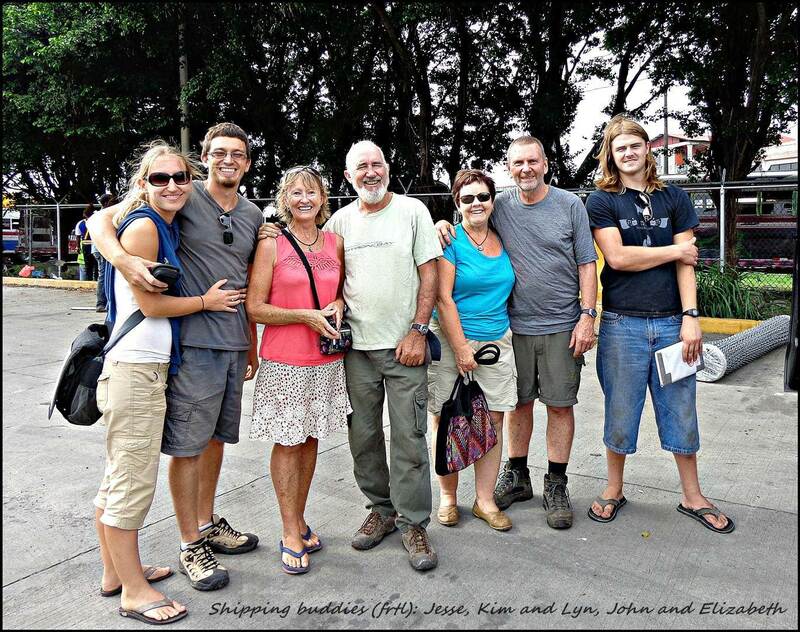 ), we used the opportunity to clean the Cruiser for the upcoming shipment across the Darien Gap. For those who don’t know, Panama and Colombia are technically connected but there are no roads that cross the Darien department in southwest Panama where it is basically swampy-jungle and indigenous tribe land not really controlled by the Panamanian government. Also, Panama seems quite happy with this situation (likely due to Colombia’s drug problem) and therefore no plans of creating an easy route across to Colombia are in the works. Good for Panamanians, bad for overlanders who have to pay the ridiculous fees associated with shipping your vehicle across the gap. The way it works for shipping your vehicle across the gap is as follows: You contact a shipping agent to find out prices regarding containers and if your vehicle is within a certain size range it is possible to fit two vehicles in a 40 foot container. If you are lucky and you can share a container with someone, then the price drops from U$1400 to U$900. However, finding an overlander to share a container with at the exact time that you want to ship can be a tricky thing. In this regard, you tell the shipping agent when you want to ship and they let you know if someone else may also be interested in shipping at the same time. We contacted our shipping agent and about two weeks before the date we wanted ship but with one week to go we hadn’t had any luck finding a partner. So, we left Cabanas Potosi to go to Panama City in the hopes of finding an overlander in the Panama City’s yacht club parking area which is where most overlanders stay during their time in the city. When we got there however, there was no sign of any overlander and the setup for camping at the yacht club was not exactly what we had expected either. The camping area was more like the street and the toilets and showers was more like the place where you freshen up if you own a yacht and the workers was quick to point out the small difference between overlanders and yacht owners. We later heard that some other overlanders had acted as if they owned the place, making it a problem for the rest of us. Anyway, after endless driving trying to get to a supermarket and then searching for any affordable accommodation option, we resigned to the yacht club at 18h00 in the afternoon with nowhere else to camp. It’s one thing to pee next to a bush on the side of the road, it’s quite another peeing on the road next to the cruiser… while a car is passing on the other side. The next morning we used the port-a-loo meant for the construction workers, which was almost dirtier than the street, but at least you had four walls around you! With no hope of finding a partner for the following week, no campsite and no more patience for Panama City traffic, we headed back to Cabanas Potosi to wait out another week. As old Murphy would have it however, when we opened our emails after arriving back in El Valle, our shipping agent had found us a shipping partner and we had to be back in Panama City within a day. Although we had a cooler full of food for our week long wait and no way of eating it all before we had to ship, we were glad to be on route out of Panama. So the next day we headed back to the yacht club street parking and spent another night praying for a strong bladder. The construction port-a-loo was still there the next morning and we were lucky to each be able to use it once before the workers locked it! As if we could make it any fuller and more disgusting than it already was! That morning we met up with our shipping partner Jesse and two other couples Elizabeth and John (from Australia) and Kim and Lyn (from New Zealand) who was also shipping the same day we were. 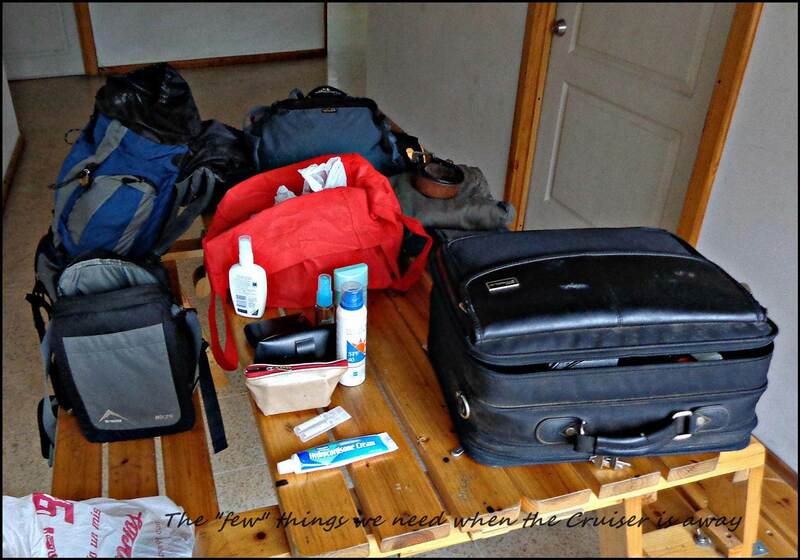 Once our shipping agent, Amy, arrived we followed her to the first order of shipping business, the vehicle inspection. Without the boring details, we managed to get the police clearance form that same afternoon. None of us wanted another night at the Panama yacht club’s luxurious accommodation and as we had to be in Colon (north of Panama City) for the rest of the shipping formalities the following day, we headed to the yacht club near Colon where Elizabeth and John had stayed a few weeks before. The concept of connecting the Atlantic and Pacific oceans goes as far back as the early 1514s when the Spanish was conquering the world. In 1821, Colombia (of which Panama became part) gained independence from Spain and in 1878 Colombia gave Napoleon Bonaparte Wyse a 99-year concession for the construction and operation of a canal across Panama. Wyse sold the rights to Ferdinand de Lesseps who had engineered the Suez Canal. Lesseps original plan was to construct a canal at sea level, but changed his mind later after it proved immensely problematic. Eventually, the entire initiative failed as the French was poorly prepared for the climate and tropical diseases which left more than 22 000 of workers dead and the project bankrupt by the beginning of the 1900s. The US stepped in and in 1902 Washington negotiated a treaty with Colombia incorporating a US-controlled zone 10km wide allocated for the a canal, with a 99-year lease. For this the US would pay US$10 mil upfront and US$250,000 per annum in rent. Meanwhile, a French activist, Phillippe Bunau-Varilla trying to return his country’s lost asset, offered Panamanian nationalist Manuel Amador the opportunity to seize the long-standing aspiration to gain independence from Colombia . He offered to fund the revolution on condition that he would become Panama’s first foreign minister with the right to negotiate a US canal treaty. In November 1903, Panama became an independent republic and before Amador could return for such negotiations, US President John Hay and Bunau-Varilla had signed a new treaty extending the US controlled zone to 10 miles, giving the US an indefinite lease and the right to intervene in Panamanian politics. Although Panama furiously objected, the US threatened to withdraw recognition of the republic and further support unless the treaty was accepted. And so the treaty was approved. The Canal commission was headed by John G Walker and Colonel George W Goethals was the chief engineer. A canal with three locks was decided upon and in this regard, the Gatun Dam was constructed to create the Gatun Lake which is responsible for the filling of the canal. It was estimated that as many as 150 000 to 200 000 immigrants joined in the building of the canal which took 10 years to complete. 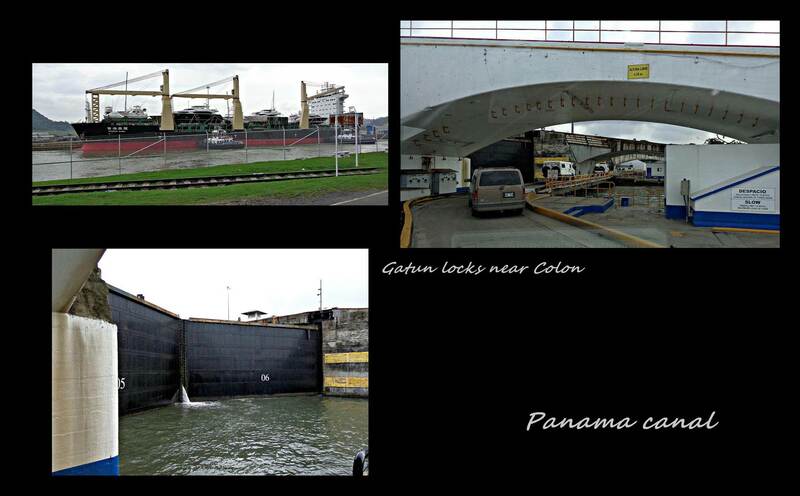 Lake Gatun has three and each of these doors weighs 750 tones. The canal has a workforce of 14 000 and operates 24 hours a day, 365 days a year. So the next morning we were off to Colon, a town many travelers have warned us is the most unfortunate place you could find yourself. It was described in 1886 by a British journalist James Anthony Froude “In all the world there is not, perhaps, now concentrated in a single spot so many swindling and villainy, so much foul disease, such a hideous dung-heap of moral and physical abomination” and we are sure if he would have visited today his opinion would likely not have changed. After a long-term economic depression, this city with a population of 150 000 people are characterized by poverty, aggression and general decay. 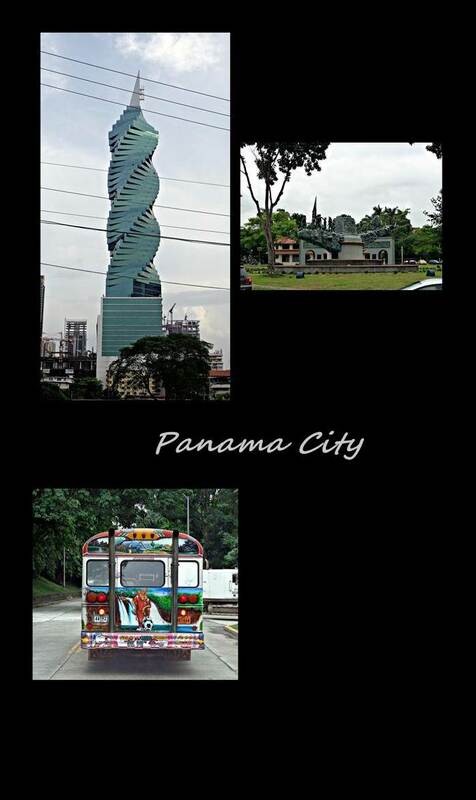 Crime and unemployment figures are the highest in Panama and from the looks of the place, it is on a downward spiral. Lucky for us we only got to spend one long day there and this was mostly at the port where the Cruiser was being loaded. Although the men was hard at work trying to get big cars in small containers, us three women, Elizabeth, Lyn and myself, was left to chat the day away on a hard piece of concrete just outside the port office. The ordeal took most of the day as, needless to say, some paperwork discrepancies slipped in that delayed the process but everything went relatively smoothly. After everything was locked and loaded, Amy was kind enough to give us a lift back Panama City where we still had to find a place to stay. After at least an hour of searching, us two and our shipping buddy Jesse, found a dorm room at the White Lion. It was one of those places which look great from the lobby but by the third floor you may as well be in a construction site (ok, I am exaggerating). We struggled through one night of stifling heat and an expensive dinner and then gave up on Panama City, got on a plane and got the hell out of there. It may have been that Panama was just the last in a string of populous, steamy-hot and slightly hygienically challenged Central American countries or it may have been that Panama just rubbed us the wrong way, but we can’t really say that we would recommend it as a destination country. We expected the shipping to be a much larger headache than it turned out and for that we are grateful to God and our shipping agent. On to SOUTH AMERICA! Try and determine a date when you want to ship your vehicle and send Tea Kalmbach (our shipping agent) an email at least 3 to 4 weeks prior to your date to have the best chance of getting a container sharing partner. Keep on confirming the date with Tea. We used Seaboard shipping company and would definitely recommend them. Before you leave the Costa Rica/Panama border, make ABSOLUTELY sure that all the personal and vehicle detail on the temporary import paperwork and insurance paperwork are correct. Do not let the insurance tell you that they cannot fill out the number of seats in the vehicle, the color and number of cylinders on the paperwork, they are simply too lazy. Nowhere during the entire shipment is any original paperwork handed over, you will need these in Cartagena, Colombia. Vehicle inspection at police inspection area in Panama City. Amy accompanies you to this area. Here they check your vehicles’ VIN number matches the number on your temporary import paperwork as well as your vehicle’s title. Paperwork needed here is one copy of driver’s passport, driver’s license, vehicle title, insurance from Panama, temporary vehicle import permit. No permit is issued at this time. Return to the police inspection area at 14h30, with long trousers and closed shoes, and get your police permit at the Secretary General office across the street from the inspection area. They require identification for you to enter the office, but do not use your passport as identification as you need it to get the police permit. When entering the building, ask the receptionist where the Secretary general office is, it is useless to try and explain where it is. Make four copies of your police permit for the next day. Meet Amy at 8h30 at the Super99 store in Colon. You receive your Panama Bill of Lading and follow Amy to the Aduana office near the port. Paperwork handed in here was three copies of each of the following: driver’s passport, driver’s license, vehicle title, insurance from Panama, temporary vehicle import permit and police permit issued the previous day. Have four individual bundles of these copies available as you will need another bundle at the port. After handing these over, you will receive the Panamanian vehicle exit stamp in your passport. You will need this in Cartagena. Follow Amy to the port in Colon where the vehicle will be loaded into the container. First, port officials inspected the vehicle and then you head to the port office with Amy. Here you pay a Panama port charge of U$44 per 40ft container and Amy hands over another bundle of the above-mentioned copies. Now it’s time to load the vehicle. You will be directed to the location of the designated container. Note that straps aren’t always available and in our case plasma ropes were used. It’s obviously up to you, but if you want it to be strapped down with ratchet straps you have to do it yourself. For your own sanity, take a picture of the seal, but they will probably break this before you see it in Cartagena. It took most of the day, but there were no problems whatsoever on the Panama side. Maybe a good idea to take an easy lunch, a good book and plenty drinking water as the area around the port isn’t really a place you want to hang around. Colon is rated as one of the most dangerous cities. Pay Amy for the 40ft container and shipping agent fee(U$1800) and payment for the movement of the container on the Cartagena side (U$180)??. Get yourself to Cartagena, it’s much nicer than Panama City. 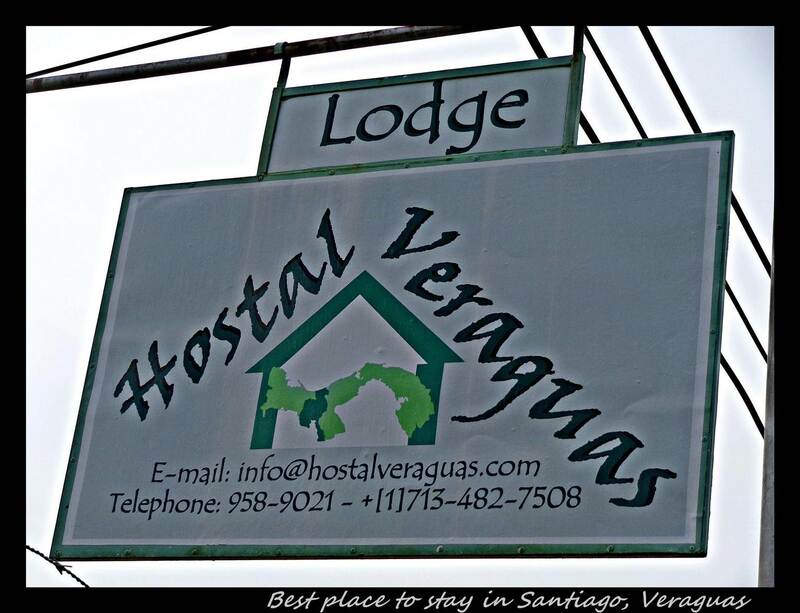 We did not use an agent on the Colombian side and after hearing horror stories from fellow overlanders we would definitely advise doing it yourself. It is not difficult even if you can only speak very basic Spanish. Everyone is very helpful and friendly. Go to the shipping company offices in Cartagena and find out if your shipping agent in Panama has paid all the necessary shipping fees. This can be done independently and does not require you to wait until receiving an email from your shipping agent in Panama and we think it will be well worth doing prior to your vehicles’ arrival in Cartagena. This will save you at least half a day (as in our case) of running around trying to figure out who is supposed to pay who if the payment wasn’t done in a timely fashion from Panama’s side. Jesus at the Seaboard office in Cartagena was an excellent help, especially since our Spanish was not up to standard. If and when the payment was done, Jesus will hand you the Colombian Bill of Lading and a checklist of all the steps that needed to be completed to clear the vehicle (with a friendly smile). If you managed to get the Bill of Lading before 9am, go to the DIAN office (you have to be there by 10h30 at the latest) to organize a time for the DIAN inspectors to open the container and inspect the vehicle. Paperwork needed here: Copies of Colombian Bill of Lading, Panamanian vehicle exit stamp, Colombian passport entry stamp, passport, vehicle title, driver’s license (?). There is a place to make copies across the street from the DIAN office. You will receive paperwork required by the DIAN inspector once at the vehicle. Go to the Cartagena port entrance (next to the Seaboard office) prior to the time arranged for the DIAN inspection to pay the inspection and container opening fees (?). This is done at an office inside the port and amounted to COP251,230.00. At the time arranged for the inspection, go to the Seaboard office (inside of the port, not the previous office) and ask them to help you find the inspectors and your container. You will need a hardhat to go into the area where your container is but in our case the Seaboard office had a spare one. Once you find the inspectors and container, the seal will be cut and you have to get your vehicle out of the container. The inspectors will check the vehicle’s VIN number, the vehicle title and the Bill of Lading. Do a quick inspection of the vehicle and the stuff inside. The inspector will not give you any paperwork after the inspection, but will tell you at which time you can pick your temporary import permit for your vehicle. Go to the DIAN office and get your temporary import permit from the same officer that did the inspection. Return to the port and go to the same office where you paid the inspection and container opening fees. Show them the temporary import permit and they will give you a release form for your vehicle. The release form will allow you to exit all security checkpoints with your vehicle. Go and have a beer and try to forget the whole ordeal!